At any given time in life we are all faced with problems and challenges. It’s a fact … you can’t navigate through life and avoid having problems. Problems will come no matter how hard you wish them away. What you believe about problems and the actions you take as a result of your beliefs will determine your level of happiness as well as your ability to work through them towards a solution. 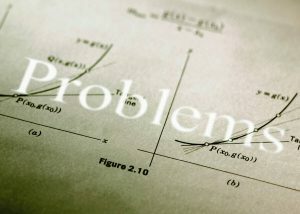 Whatever problem you are experiencing … chances are someone else is dealing with one that would make your problem look like a sneeze in comparison. While it is our inclination to immediately try to resolve the problem, sometimes it is best to sit in it for a short spell. Why? Just to make sure you are understand and address the cause of the problem and not just the symptom(s). You can ignore a problem and bury your head in the sand. However, it is just a matter of time before it rears its ugly head again. Only this time the head will be a little bigger and a lot uglier. At some point after sitting in a problem (for too long) and not coming up with a solution – the only way out is to take the focus off of yourself and serve others. Self-centered-ness can lead to depression. If the problem exists … the solution exists simultaneously … you just might not be able to recognize it in the moment. Step back, breathe, and walk away for awhile. When you come back there is a good chance you will see things in a different light and the solution (which may have been there all along) will be more evident. Would you be willing to share your wisdom with the rest of us? Who knows, your wisdom might just influence someone who needs a little help today and besides we’d love to hear from you!